Our dear friends came for their first visit last week. We had a wonderful time showing them around our new home. We shared with them a few of our favorite places and things and experienced a number of new things together. The weather didn't always cooperate as planned, but it proved it to be perfect for their weekend here and we put it to good use cramming every second of it we could. Of all the fun things we did (there are too many to talk about at once), it is easy for me to pinpoint my favorite. Shockingly enough, it wasn’t my first visit to Napa, but our trip with them to Yosemite. 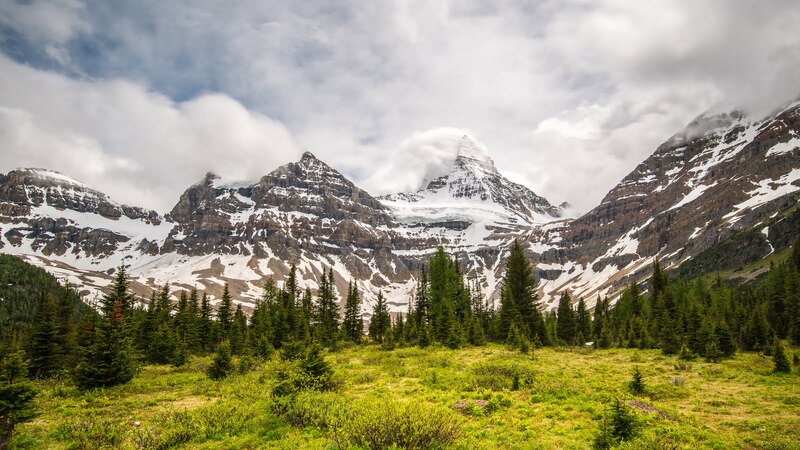 Pure magic laid a thick white blanket of snow over the place in the winter time and, as excited as they were to see the famous granite peaks for themselves, Adam, Landon and I were probably even more excited to see it dressed in white. Of course, she didn’t disappoint. Now frequent visitors to the park, it was still a new experience for us in so many ways. 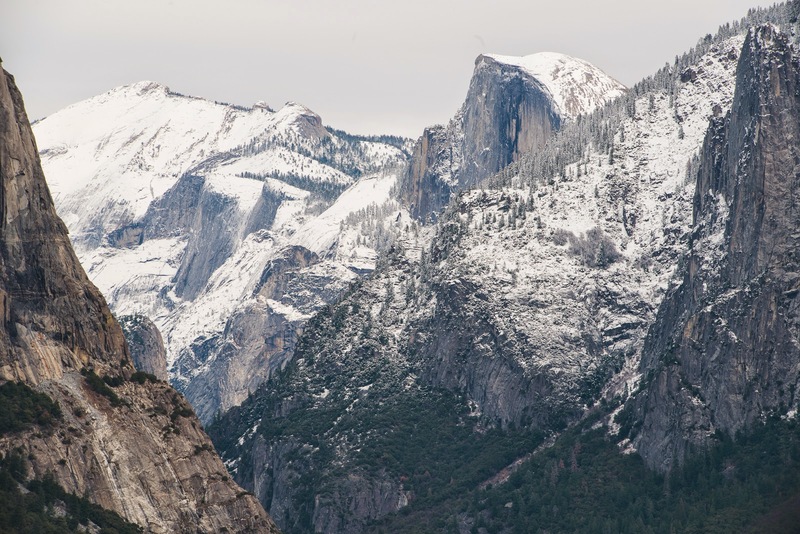 From the snow on the peaks to our trip to the Sequoias, this trip there was unlike any of our others. Lame is all I can say. 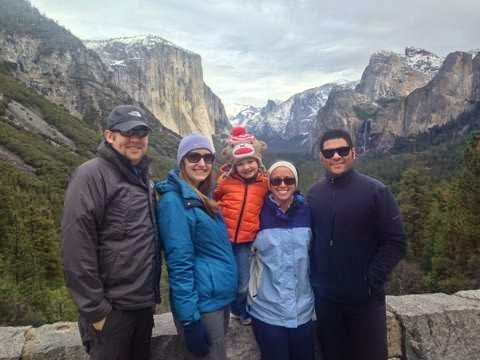 When we arrived, our first stop was tunnel view to show our newbies a breathtaking view of the valley. I never tire of this view. It was especially beautiful with the snow laced mountains. Bridalveil falls was going strong as well which was another first for us. It made me excited to see the falls in the Spring when they are the strongest. It also made me excited to come back when the snow is three feet deep even in the valley. It's also a great spot for a group photo. 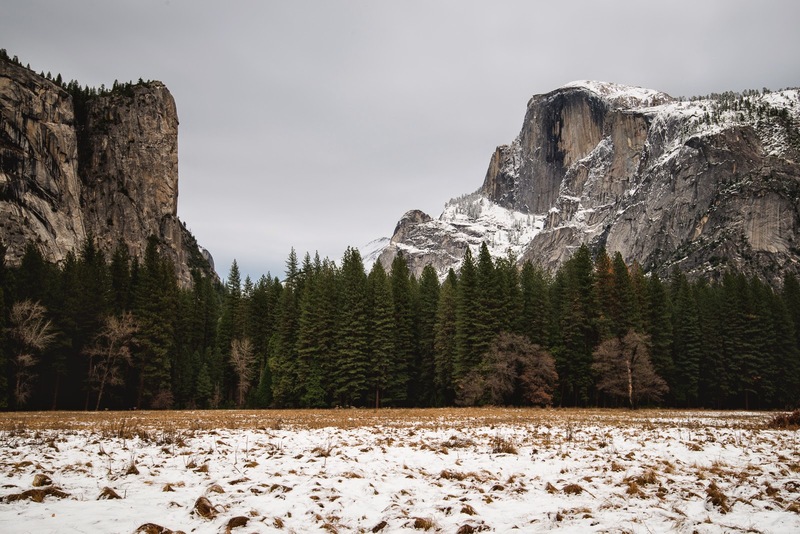 After tunnel view, Adam drove to one of his favorite meadows to snap a few more pictures. The best part? Landon got to play in a little snow! He was SOOOOO happy! This might prove to be our family Christmas picture for the year. 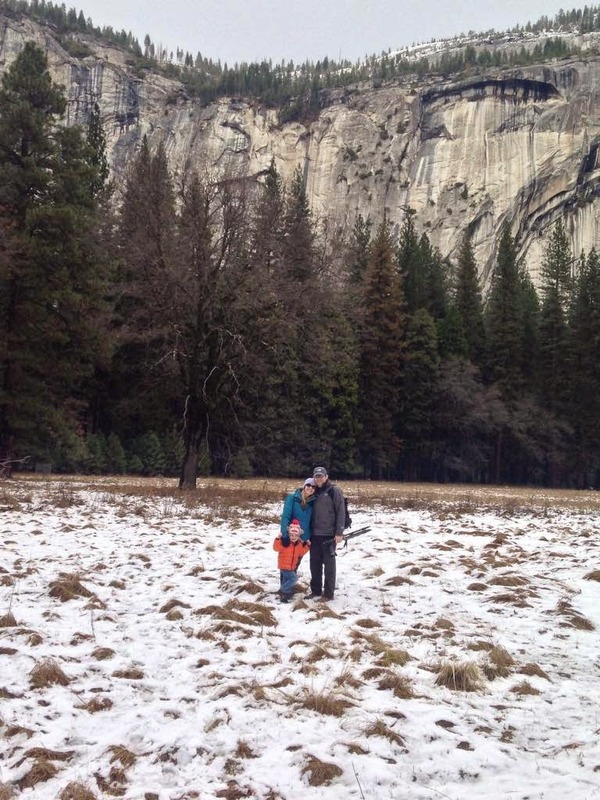 I'm ok with that since Yosemite has become a part of our lives. For Landon, it couldn't be Christmas until he saw snow. We came across the ice skating rink as well and contemplated spending the some time ice skating, but decided against it. We stopped at the cafe for a quick bite to eat and tried to decide what we should do next. 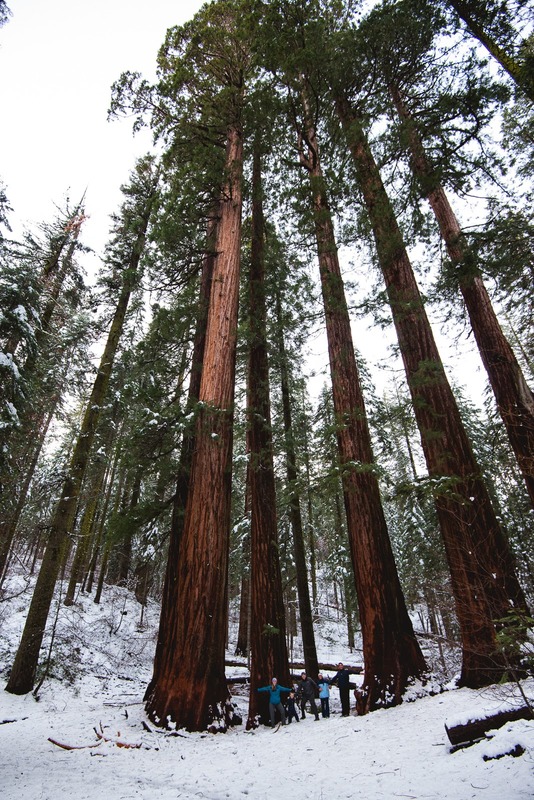 Should we take a chance and visit the Sequoias? 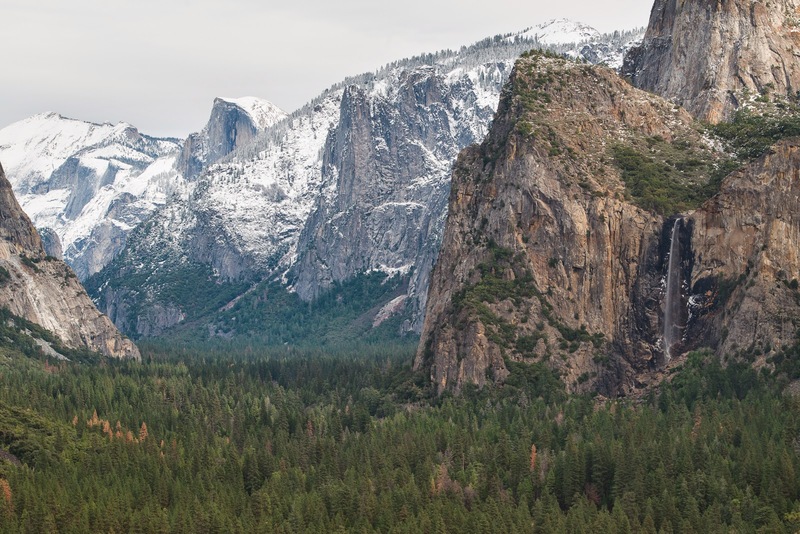 Or opt instead for the short valley hike to Yosemite Falls? Before arriving, we learned that the road to the Sequoias at Mariposa Grove was closed and only accessible by hiking there. So, when we got to the park, we asked the ranger what the hike would be like. 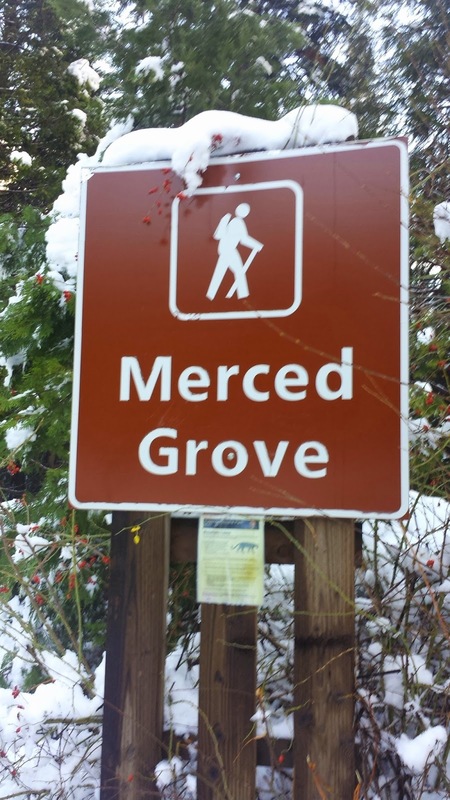 He wasn't too confident in the conditions, but suggested instead that we might have more luck going to Merced Grove. 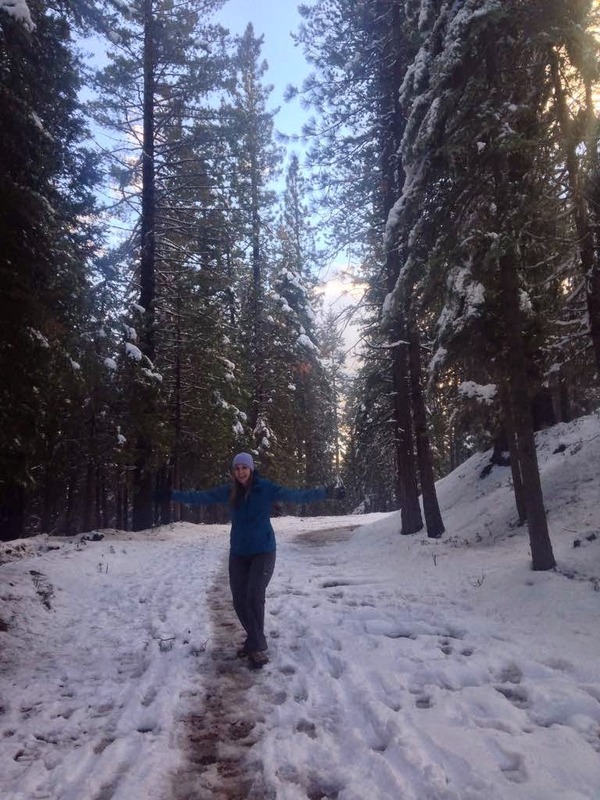 The road to Merced was open and the hike to the Sequoias was only 1.5 miles. Although there was some snow in the area, he said the conditions were more favorable. The only real downside he said was that it was a small grove with only 15 trees. We decided 15 Sequoias was better than zero Sequoias so after a quick bite, we got back into the car and headed up from the valley and into the trees. 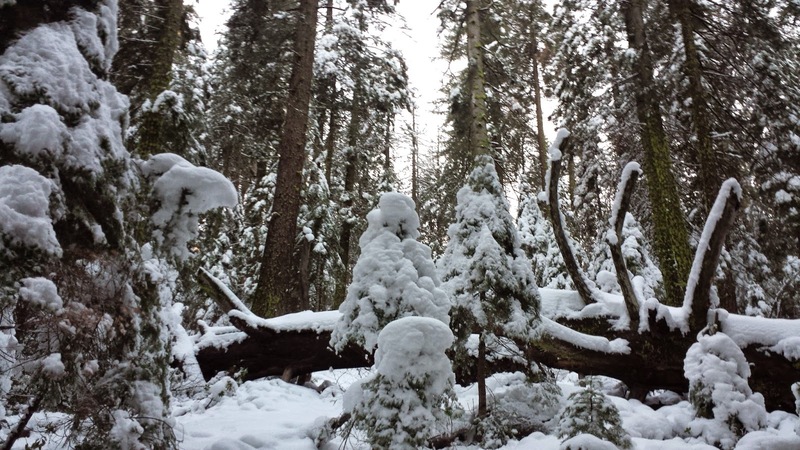 As we worked our way up the from the valley floor, the light dusting of snow became a beautiful blanket covering the ground and weighing down the massive evergreen branches. 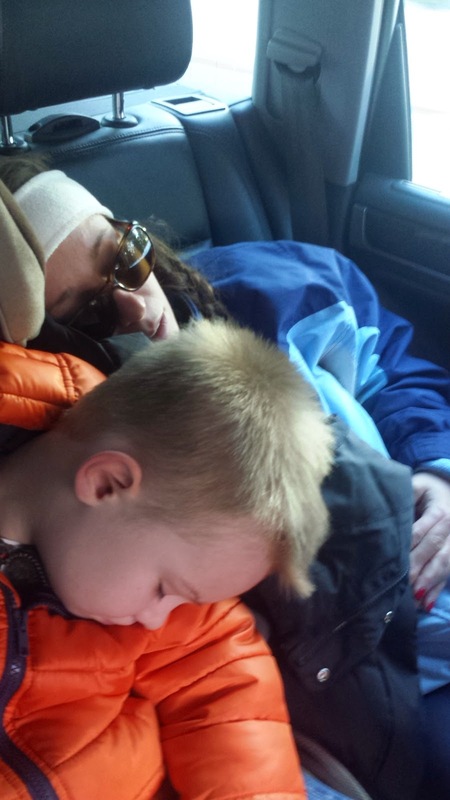 At that point, we knew driving up to the grove was the right decision (those of us awake at least). We arrived at the trail head a little after 4pm and we knew our daylight was very limited. The snow looked pretty deep, but we didn't come all this way for nothing so I got Landon's snow suit on him and we started the hike trying to hurry and reach the giants before we lost the light. As quick as we were trying to be, none of us could help but to stop every so often and admire the surroundings. 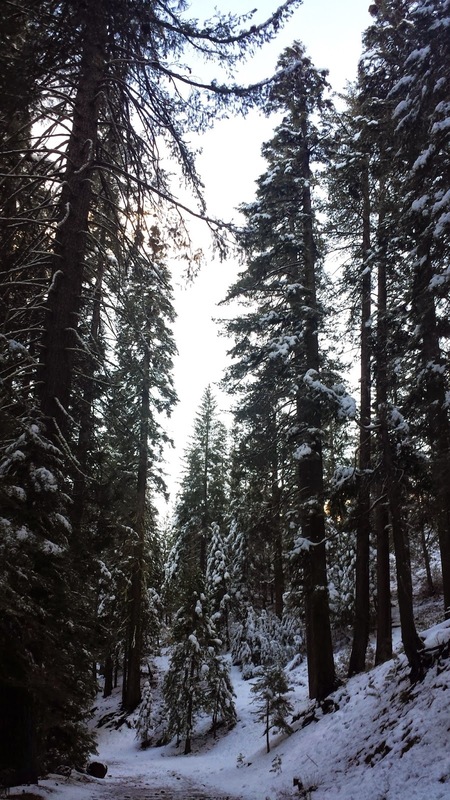 This was Christmas, massive evergreens, snow, and a seemingly perfect trail all to ourselves. 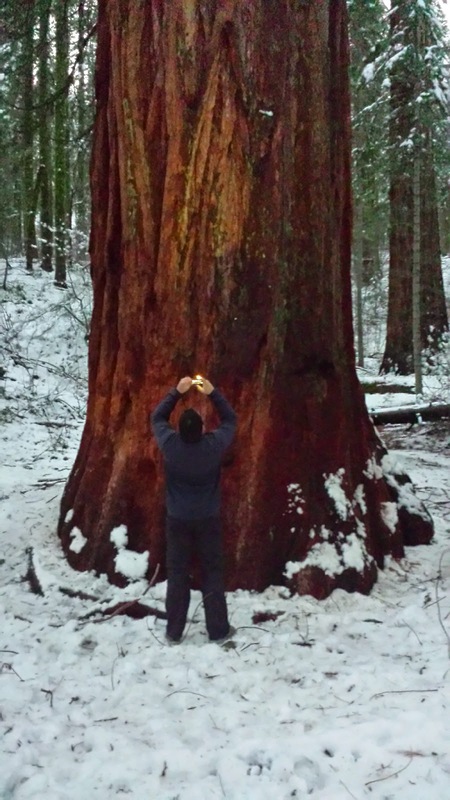 As much as we wanted to see the Sequoias, it took a lot of convincing at one point to make Adam keep going. He just wanted to stop and take pictures of what was laid out in front of him. I couldn't blame him either, picturesque didn't even begin to describe it. We did manage to throw a few snowballs and shake a tree or two along the way as well. As we continued along the trail the light began to fade and the sky went from a bright blue, to a soft yellow, purple, and pink. 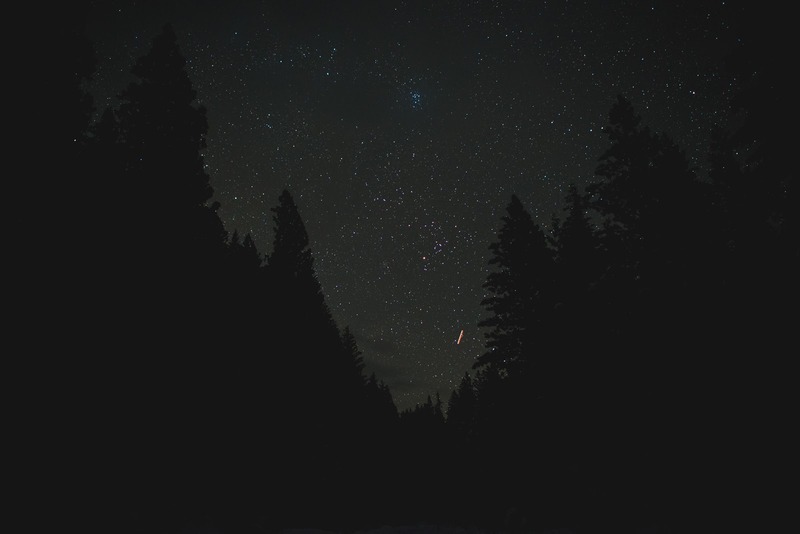 The entire forest seemed to glow, glisten, twinkle. It was a magic few minutes as the snow reflected the myriad of colors. Just as we started to think we had to be reaching the 1.5 mile mark, Sergio pointed out what he believed was a Sequoia in the distance in the middle of the trees. While it definitely looked larger than the others, none of us were sure, but we could see that the path ahead would give us a closer look. As we continued looking at it to the left and preparing to follow the path in that direction, someone changed the direction of their head and suddenly called out to look at the ones ahead on the right. Just about 100 feet in front of us, in a straight line were five of the biggest giants I had ever seen. If the Redwoods at Muir leave me speechless, these knock me off my feet. If the sheer girth of these giants wasn't enough, their height seems physically impossible. And although no amount of words or pictures can adequately portray what you just need to see with your own eyes, I think this picture of Landon standing to the left with his arms spread wide makes an impression. Adam quickly set up his tripod and we decided with the sliver of daylight left to try and get one group shot. He was able to get all of the trees in although the lens disorts their size somewhat. Still, can you even make us out at the bottom? Just barely. Remember, we are almost 6 feet at the base there (some of us at least). At this point, we knew we'd be hiking back in the pitch black. We weren't really prepared for that and given that at least a mile of the hike to the groves was downhill, we knew it was going to be a trek back to our car. So we took one last look at the trees and started back. 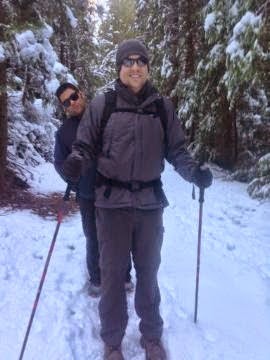 Hiking back in the tall snow wasn't easy, but none of us complained. Even Landon did an amazing job. Three miles isn't a huge stretch for him, but three miles of snow, uphill in the dark is a challenging even for even adults. As if the park and the snow and dusk and the Seqiouas were not enough, my favorite part of the day happened as we made our back up the trail. Day turned into night and it was the stars turn to stun us. Adam and I couldn't decide if it was more stars than we had seen in the mountains in Switzerland or not, but it was darn close. 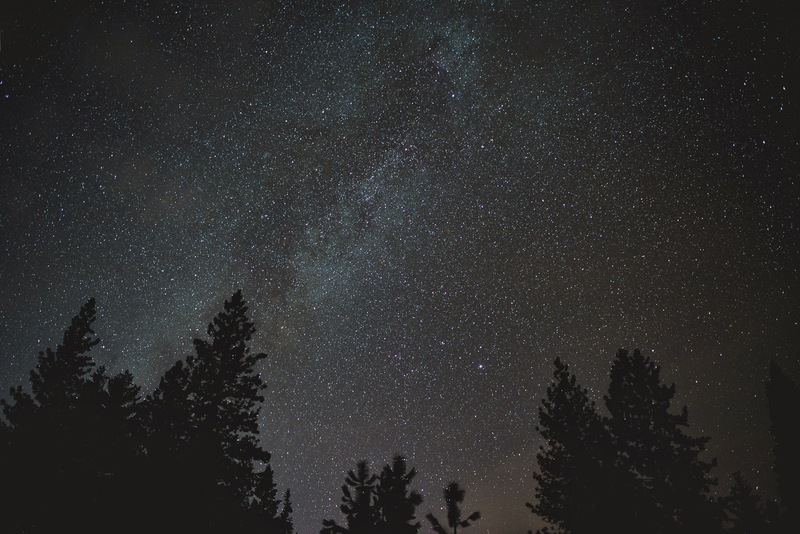 As we hiked, someone would call for us to turn off all our lights and we stood in the middle of the large path looking up past the silhouettes of the tree tops and right at a million stars shining back at us. It felt like we were the only people left in the world as peaceful as it was out there . 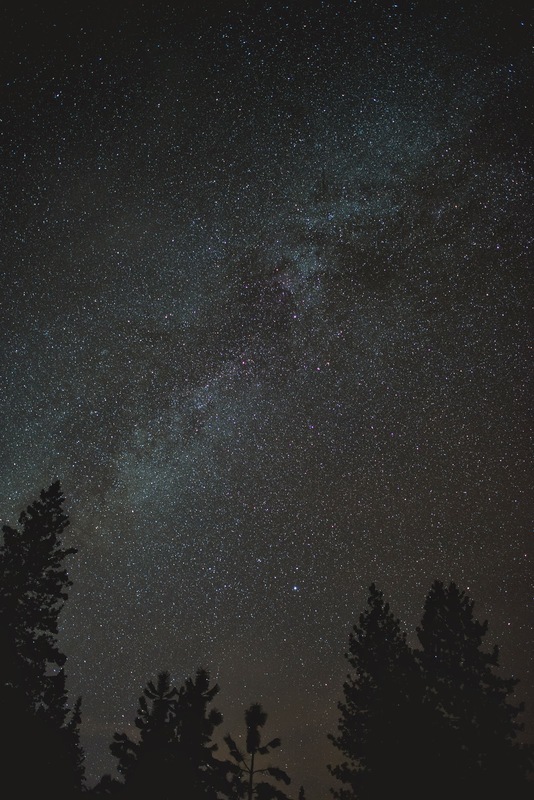 We stared at the Milky Way, this amazing system that we are a part of which. It never ceases to amaze me and I'm not sure I've ever seen it so bright. I love incorporating Adam's wonderful pictures into my stories, but I've said it before and I'll say it over and over again, pictures don't even begin to do it justice. I could have stood and stared up at these stars for an eternity. We've got to find ourselves a dog sitter since Kaiser isn't allowed in many parts of the park. Once we do that and Adam's busy season is over, we will be planning a number of outings to Yosemite and the Sequoias. 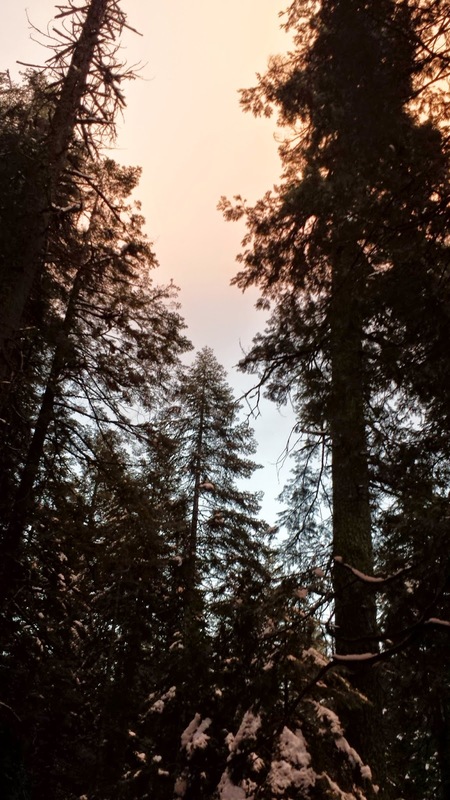 I know we will never have this exact experience again and the initial shock of seeing the Sequoias for the first time cannot be duplicated, but I also know every time we go has been better than the last and I cannot wait to see what in the world could ever top this. Beautiful! I am loving all your posts. It really makes me want to see this part of the country. Thanks! You should make your way out West sometime. It is vastly different and there is so much new stuff to do and see.